The Great Fire o Lunnon bi an unkent penter, depictin the fire as it wad hae appeared on the evenin o Tysday, 4 September 1666 frae a boat in the vicinity o Touer Wharf. The Touer o Lunnon is on the richt an Lunnon Brig on the left, wi St Paul's Cathedral in the distance, surroondit bi the tawest flams. 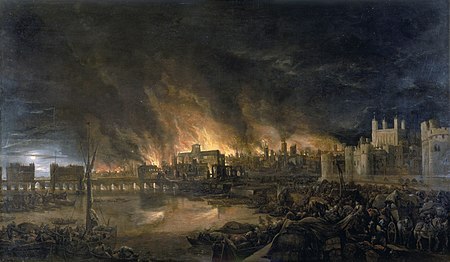 The Great Fire o Lunnon wis a major fire that soopit throu the central pairts o the Inglis ceety o Lunnon frae Sunday, 2 September tae Wadensday, 5 September 1666. The fire guttit the medieval Ceety o Lunnon inside the auld Roman ceety waw. ↑ Aw dates are gien accordin tae the Julian calendar. Note that, when recordin Breetish history, it is uisual tae uise the dates recordit at the time o the event. Ony dates atween 1 Januar an 25 Mairch hae thair year adjuistit tae stairt on 1 Januar accordin tae the New Style. This page wis last eeditit on 1 November 2017, at 03:07.